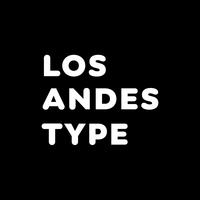 Located in Concepción, Chile, Los Andes was established in 2011 by Daniel Hernandez, Miguel Hernandez and Luciano Vergara as a spin-off of LatinoType. Their goal was simple: to make typefaces that would simplify the job of the designers who used them. The young foundry published its first typeface, Pantano, that same year and the rest, as they say, is history. With talented designers such as Mendoza Vergara, Daniel Hernández, Luciano Vergara, and Miguel Hernández in its ranks, Los Andes has created a library full of vast variations including everything from bestselling headliner typefaces like Darwin to grunge-inspired rustic families like Pantano. “Our typefaces tell stories,” Luciano says, “we are inspired by travel, nature, experiences and tastes when we design typefaces.” One of their more recent releases, Garden, was inspired by the cheerful and warm people the designers encountered when visiting Brazil in 2013. A young foundry with a wide range of talents and endless inspiration, keep an eye out for more typefaces from Los Andes!